If you're searching for the Views at Mt. Fuji wedding photos, chances are you'll probably end up on my page for Tulika and Vishesh's wedding photos. What an absolutely incredible wedding venue. The Views at Mt. Fuji is a very unique Asian inspired wedding venue. 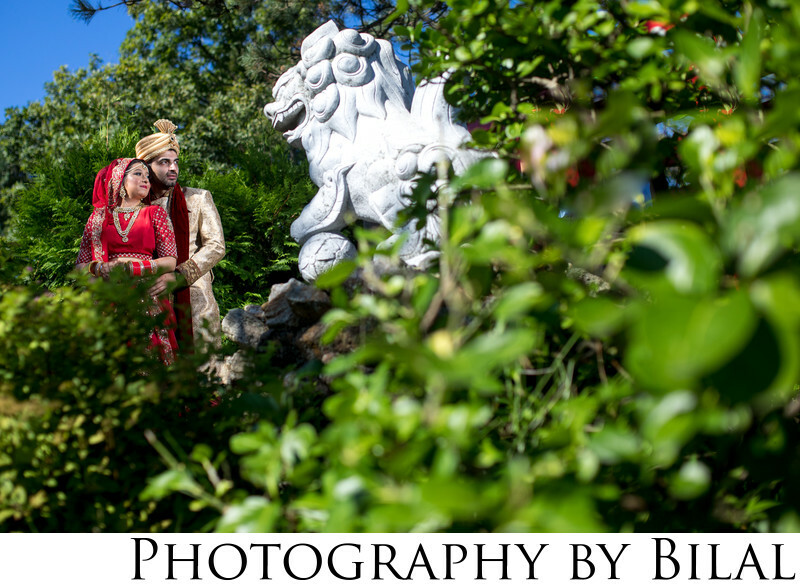 The bride, Tulika, was specifically looking for a very Asian inspired venue and this was the very best in the area. The views of course have breathtaking views from top of the mountain. This photo was taken in the "arches" section of the venue, which is right across from the main entrance. The statues made for a great photo opportunity and of course I had to take advantage and incorporate it into my frame. The photo was lit by 1 off camera flash - it's amazing what one little flash can do - it completely eliminated the shadows and lit their faces very nicely. The flash was placed behind the brush you see in the photo - and was actually visible but I had used some photoshop magic to make it disappear. In conclusion i'd highly recommend this venue for a late summer, spring, or early fall wedding. During mid summer it may get a bit too hot - this wedding was mid-September and the heat was just brutal. It might be a bit too much during mid-summer. Location: 296 NY-17, Hillburn, NY 10931. Keywords: hindu wedding NY (3), indian wedding NY (3), NJ indian wedding photographer (48), NY wedding photographer (3), the views at mt. fuji wedding (3).